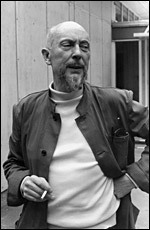 Len Lye was one of the few filmmakers working in inter-war Britain to have established an international reputation in experimental filmmaking. Though his British oeuvre was by no means limited to the making of abstract films, this was the area that most interested Lye and he has sometimes been viewed as the only genuine avant-garde filmmaker of this period. This is undoubtedly an overstated case, but Lye earned his reputation through a sustained and idiosyncratic body of films that were often brilliantly inventive and technically accomplished. Born in Christchurch, New Zealand in 1901, Lye began to develop a style of art based on 'doodling' from an early age, which stirred his interest in the 'pre-rational'. He was deeply interested in movement and wanted to portray kinetic energy within artistic works; he also drew on aboriginal art, which for Lye again represented a 'pre-rational' artistic tradition. He moved to London in 1926 and soon joined the Seven and Five Society , a modernist group of British artists. Before long, he was exhibiting with this group, but he was dissatisfied with the static visual medium and began to make experiments in animated film, which more closely fitted his interest in movement. Between 1926 and 1929, Lye made drawings for what would eventually become his first film, Tusalava (1929). The film was a painstaking effort, involving around 4000 separate drawings, but the result was a unique animated film that dramatised active processes of a not-quite-concrete nature. Difficult to describe, the film contains a host of shifting shapes, such as dots and circles that wriggle and twist, as well as a recurring totem figure that is the most concrete element of the film. Poorly received, Tusalava only secured limited screenings. Subsequently, Lye found it difficult to attract sponsors for his filmmaking, and only made one more film before joining the GPO Film Unit , Experimental Animation (aka Peanut Vendor, 1933), a three-minute puppet film sponsored by exhibitor Sidney Bernstein . He then began to experiment with painting directly onto celluloid, a technique that he pioneered. In order to satisfy sponsorship requirements he had to include advertising slogans in his first GPO film, A Colour Box (1935), but managed to do so without relinquishing his abstract objectives. Rather than following one line of movement, Lye presented a mass of complex and jumbled movements through painting directly onto celluloid. This had the added effect of creating a greater sense of off-screen space, as if the patterns are streaming in and out of the frame. Furthermore, the dynamic shapes seem to dance to the popular Cuban music making up the soundtrack. In contrast to Tusalava , A Colour Box was reportedly popular with audiences and gained significant critical acclaim. Perhaps due to the pressures of working within a documentary environment, Lye increasingly began to incorporate more 'concrete' symbols within his films, yet did so in a rather idiosyncratic manner, continuing to formally experiment with music, colour and movement. After making a puppet film with Humphrey Jennings , Kaleidoscope (1936), he experimented with the Gasparcolour process in Rainbow Dance (1936). Lye used a recurring silhouetted figure in the film, enacted by dancer Rupert Doone , and transformed the surrounding mise-en-scène into a colourful, shifting landscape, aided by the use of stencil patterns and deregistration effects. Lye continued to incorporate more realistic material in his next film, Trade Tattoo (1937), which used found documentary footage and overlaid it with a number of colour abstractions (this time using Technicolor). In N or N.W. (1937), Lye began to work with more conventionally 'dramatic' material. The film, advertising the benefits of writing letters and using the postal system, centred on a simple narrative of lovers at cross-purposes who are eventually re-united. Yet Lye used a number of unconventional edits, extreme close-ups, trick shots and superimposed animation in order to take a creative approach to such a conventional theme. This was his last film made for the GPO Film Unit ; afterwards he contributed to newsreel production and created two fantasy sequences for the feature film Stardust (d. Melville Brown, 1938). He completed an abstract short Colour Flight (1939) for Imperial Airways, and then came a musical, animated film, Swinging the Lambeth Walk (1940). During the war, he made a number of propaganda films for the Ministry of Information as well as filming British material for the American series March of Time . In 1944, Lye moved to New York, where he co-directed four educational one-reel films with I.A. Richards . This marked a new stage in his career, and in the post-war period, he continued experiments in abstract filmmaking, as well as making a number of kinetic sculptures. Lye remained in America until 1968 before returning to New Zealand. During this period, he managed to secure his reputation as an important non-representational artist. Many noted modernist artists have made films in Britain - William Coldstream , Francis Bruguière and László Moholy-Nagy - however, their contributions to the medium were minor compared to Lye , who adopted filmmaking as his primary medium of expression.